Next door to Wellington you'll find Wairarapa - a stunning region known for its wine and food, boutique shopping and accommodation. It's the perfect day trip or overnight stay from the city. Much of the beautiful wine and food found on the menus in Wellington’s restaurants is grown here. All just over an hour's drive or train ride from Wellington. Martinborough is packed with colonial charm, with over 20 wineries most within walking or cycling distance of the quaint village square which is laid out in a Union Jack pattern. Some of New Zealand’s best pinot noir comes from the town’s friendly family-owned vineyards. With the small vineyards and olive groves being so close to each other cycling-the-vines is a very popular thing to do. Enjoy lunch outside at one of the attractive vineyards. Greytown is on State Highway 2 (and is just 15 minutes drive from Martinborough). This country village oozes metropolitan style. There’s a sophisticated mix of independent boutiques, galleries, antique stores and cafes which make it one of New Zealand’s premiere shopping destinations. Beautifully restored Victorian wooden buildings line the Main Street. Tranzit Gourmet Martinborough Wine Tour is a guided tour takes in four of Martinborough vineyards and includes lunch. Learn why this charming village is home to some of the world’s top Pinot Noir. Hammonds Palliser Bay Tour. Explore part of the Wairarapa coastline and see the famous Cape Palliser lighthouse, the fishing village of Ngawi, the fantastic seal colony and some dramatic Lord of The Rings film sites. Village Artisan Tour is a full-day guided tour from Wellington to Greytown, Martinborough and Featherston. Experience beautiful boutique shopping, lunch, wine and cheese while all of your transport is taken care of. Trains run every day connecting Wellington with the Wairarapa towns of Featherston, Greytown, Carterton and Masterton. Check out a Wellington to Wairarapa timetable. Simply catch a connecting bus to to get to the wine village of Martinborough or the colonial village of Greytown. To get to Martinborough simply hop off the train in Featherston and board a Martinborough bus which meets every train (except the late train on Fridays). Another option is to book a shuttle with Rimutaka Shuttles or Martinborough Shuttles. Martinborough Wine Tours also offer transfers to/from Featherston station with bookings. To get to Greytown during the week hop off the train at Woodside Station (its 5km out of town) and board the bus which meets all weekday trains (except the late train on Fridays). It will whisk you straight to Main Street Greytown. To get to Greytown on weekends you’ll actually need to get off the train at Featherston Station. This arrives at 10.55am. You hop on the route 200 bus waiting at the station at 11.00am which takes you to Main Street, Greytown. You’ll arrive there at 11.20am. To get back to Featherston to catch the train back to Wellington on weekend afternoons, catch the route 200 bus at 4.55pm outside St Johns Hall (opposite The Hub) on Main Street, Greytown. This will get you to Featherston Station at 5.10pm in time for the train. You'll return to Wellington at 5.25pm. Or use pedal power - bring your bike on the train and cycle into town along the pretty Woodside Trail. Bringing your bike? Just get to the station early at peak commuter times (4.25pm and 5.30pm) as the bike carriage can fill up fast. Green Jersey Shuttles depart Wellington for Martinborough daily at 9.15am (also stopping at Petone and Kaitoke for the Remutaka Cycle Trail). They then depart Martinborough for Wellington at 5.45pm, and Wellington airport at 7.30pm and Wellington i-SITE and Railway Station at 8pm for Martinborough (also stopping in Greytown and Featherston). Learn more here or book online here. There are plenty of car rental options in Wellington. We recommend Cross Country Rentals. 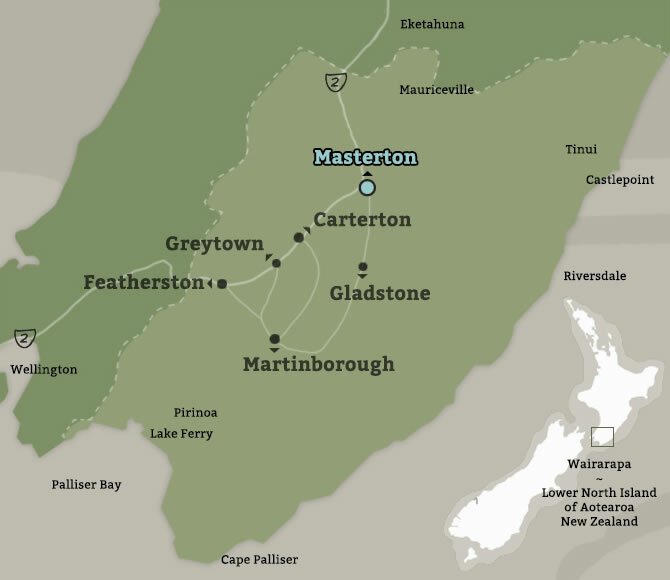 Cross Country and Carzone Rentals have offices in Masterton. We think there's a pretty big likelihood you'll like it here. We'd love you to stay a night or two. Have a look (and book) top-notch Wairarapa accommodation.